At first glance, Circle Empires looks like a lower production quality PixelJunk Monster (which were Tower Defense games) game. But apart from the simplistic MSPaint-drawn art style, Circle Empires is a straight up RTS game using the gimmick of connected circles as its map. It offers a few different game modes and a super streamlined base building mechanic that even a baby could understand (babies are getting much smarter these days). The RTS-lite trend involves simplifying mechanics down to the basics. Ditching the complexities of the genres to focus on the core gameplay loop. Some of these games have done quite well. Circle Empires attempts to ape this. It boils down an RTS to its basics and builds a game around it. It doesn’t quite succeed in what it’s trying to do though, as I’ll explain later on, as I introduce to you the different (albeit extremely limited) facets of the game. 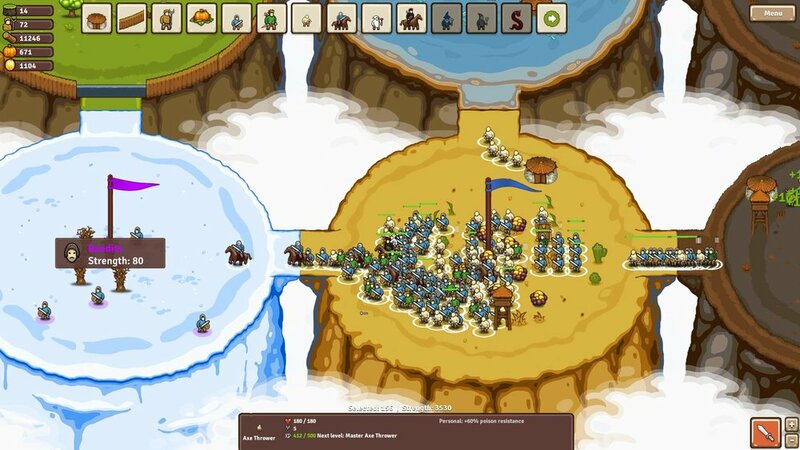 Circle Empires is an entirely single-player game. There is no multiplayer or coop. So if you were hoping that multiplayer would at least give this game strategic depth, well too bad. All you need to worry about is food, gold and wood. All units you produce require food. Some units require gold and food. While some others require wood and food. There is no unit maintenance cost. So resources are only used for building units, structures and upgrading units. Select different leaders and get some unique buffs or bonuses. There is no research of any sort, but you can spend some of your resources to upgrade armour to increase defence or weapons to deal more damage. Each circle gives you particular resource or a mix of them. It's essentially different terrain/biomes. There's nothing special with these circles other than some of them having some movement penalty or some resource bonus. Some circles have treasure chests that give you some random loot or a random enemy unit that will join your army. This is a nice little feature but is made insignificant due to the ease at which you accumulate resources. 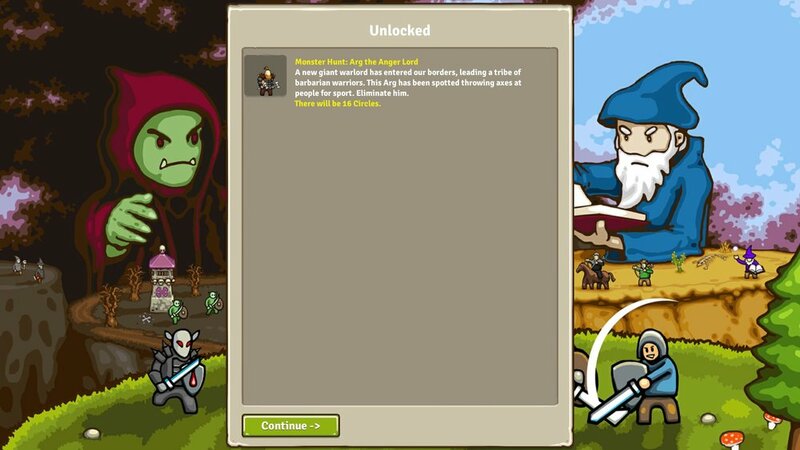 Your citizens gain experience over time and once they level up, they get to gather resources at a much faster rate (levelling up is handle automatically). 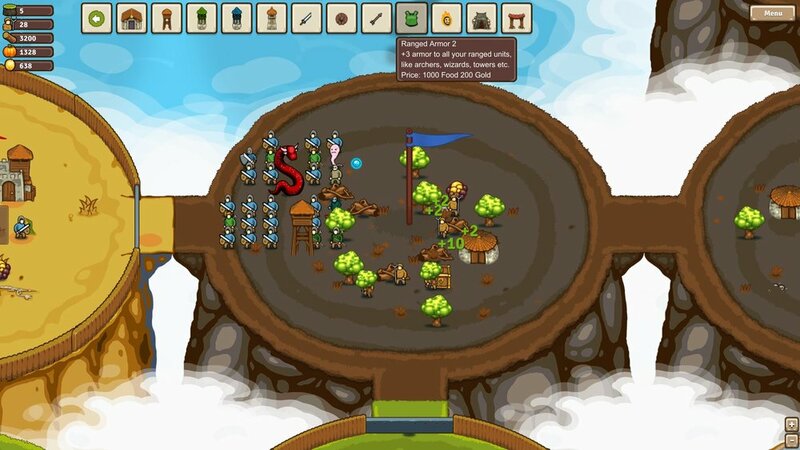 Eventually, as you conquer more circles by marching your army in and destroying the occupying enemy units, you’ll be collecting so much resources, you’ll be swimming in it. If there’s one thing Circle Empires gets right, it’s in the variety of units you can train. From swordsmen, archers, knights, wizards, to dragons. You could have a huge army with lots of different units. Get some healers and your army will be in good shape for a major offensive. Unfortunately, army variety is totally unnecessary most of the time. The best strategy is to mass cheap units, create a massive blob and march them into the enemy circle. The main strategy, is to mass units. Behold the blob of death. This usually does the trick and overwhelms the enemy. Except in one instance. Circle Empires has three single-player modes. You have conquest which is dominate every single circle and win. There’s annihilation mode where your objective is to destroy the AI faction. Monster Hunt is perhaps the most interesting modes. Monsters present a more unique challenge. These two modes aren’t very exciting and doesn’t put up much of a challenge for a strategy veteran. After a few times playing this mode, it quickly becomes boring as you feel you’ve hit the limit to what you can experience in Circle Empires. But the Monster Hunt mode is where Circle Empires excels at. You unlock a series of new monsters to defeat with each victory. Each monster has a specific type of attack. There's some good unit variety. You could even train a dragon. But why bother when the blob of death works just as fine? For instance, in one map, the monster had a powerful Area of Effect attack which destroys my cheap spam units in a matter of seconds. Monster Hunt mode requires you to think a bit more… which is the thing that’s at the core of a strategy game, and something that Circle Empires lack in its other game modes. Circle Empires is a mere USD$7.99. It’s a casual simplified bargain bin RTS. Not everything in the bargain bin is good and not everything that’s casual and simplified gets it right. I’m not letting the cheap price get in the way of my review because I believe even at USD$7.99, your time is better spent elsewhere and there are way better cheap games you can get that bring much more enjoyment than Circle Empires. Making a simple RTS game is not that simple... no pun intended. You can’t just boil it down to the basics and expect it to be good. Thought has to be put into the gameplay loop and the satisfaction of its game modes. If Circle Empires had multiplayer, I could see it being much more enjoyable to crank up the difficulty and take on the AI in coop or challenge other humans that would throw much more interesting tactics and strategy at you. As it stands, Circle Empires is a forgettable single-player only RTS that forgot to put the fun in its gameplay. It's missing the core of what makes an RTS great, which is great balance, challenging AI and an interesting campaign. Jun 28 Northgard Review. Here Comes The Vikings!